What do you do when what you want is at odds with what another person wants? No one is exactly like you, so it’s inevitable that others will disagree with you at times. Conflict is actually a natural part of working with or living with someone else. Next time you find yourself in conflict with someone at work or home, implement this five-step process to find a win-win solution. Your instinct might be to argue or defend your own position, but you have to resist that impulse. At this stage, all you do is listen. Your goal is to discover WHAT the person really wants. As you begin to understand this, you may discover it’s not what you thought, that in fact you’re not actually opposed to it. And then you continue to pay attention, listen to understand and check what you hear. Again, you have to resist the urge to argue or defend your position. Your goal is to find out what NEED is driving the person to push for this particular outcome. So now you've listened to find out what the other person wants, and the NEED that drives those wants. If you've done that well, he’ll feel that you really understand where he’s coming from. Then say why it’s important to you, something like: “The reason I want this is because it’s a way for me to…” Complete the sentence by stating the goal or NEED that has led you to want it. Tell the other person that you’re flexible, that you’re open to other possibilities, and that you believe there may be ways to meet both your needs that haven’t been considered yet. Ask the person to join you in coming up with some new ideas to specifically address both your needs. You may have to come up with the first idea. Encourage the other person to think of some, too. Try to push for at least ten ideas. Be sure to write them down, so you can review them. What you do next is ask the individual to point out which ideas he likes best. You do the same thing. Then identify the ideas that appear to be acceptable to both of you. 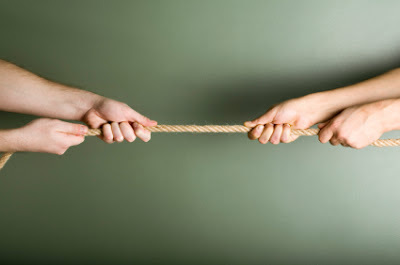 If you take an approach that seeks a win for both of you, the tension dissipates. And you’re much more likely to resolve the situation in a way that leaves both of you feeling satisfied. This approach works likes magic. Really. Great post Meredith. Takes practice but worth the effort.